On the 12th September 1304 a fire raged through Mansfield Woodhouse and destroyed much of the village including the wooden steeple of St Edmund's church. The 104ft tower and steeple were rebuilt in the same century using local stone. 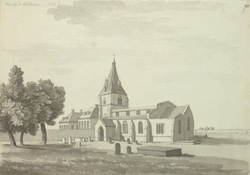 The church underwent further reconstruction in the 19th century.